A three day international seminar on Interculturality and Sustainability was held at the rural town of Ed. Open Space workshop style was utilized to innovatively discuss the meeting points among differences. It was felt that sustainability can grow in the in-betweens, from the not yet defined; in meeting between differences. Meetings between rural and urban; between academic knowledge and manual knowing; history and futures; intensity and rest took place among scholars and practitioners from around the world. The delegation from Uganda and Tanzania added to the charm of the event. The seminar was co-sponsored by The Academy of Sustainable Development, the Swedish Institute and University West of Sweden. Dr. Marcus Bussey of the University of the Sunshine Coast, Queensland, Australia spoke on the Shaman and Microvita and provided valuable insights into sustainable futures and the personal and cultural shifts necessary to carry this vision forward. Goran Hjort of the Academy of Sustainable Development reflected on the banking crisis in the world and offered the alternative of an interest free banking system which replaced greed with ethics and service spirit in economics. Professors Mirium Sannum and Ase Bjurstrom thanked the fifty participants for the moving experience of thinking deeply about such serious topics. Rektor of the University, Prof.Lars Ekedahl concluded by expressing the hope that the networking generated by the participants will create a positive ripple effect in the whole world. 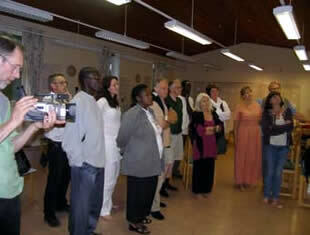 On June 5th, 2009, a program on World Sustainability was held at University West (Hogskolan Vast) in Trollhatten, Sweden. The University had invited Dr. Marcus Bussey from Australia and Dr. Shambhushivananda from Ydrefors, Sweden to speak on PROUT as a viable path of sustainability for the world. The program coincided with the World Environment Day celebrations and the 50th anniversary of PROUT. Dr. Shambhushivananda introduced PROUT within the broader academic and social discourse. There was considerable interest and many sought deeper explanations from him during the question and answer session following the talk.